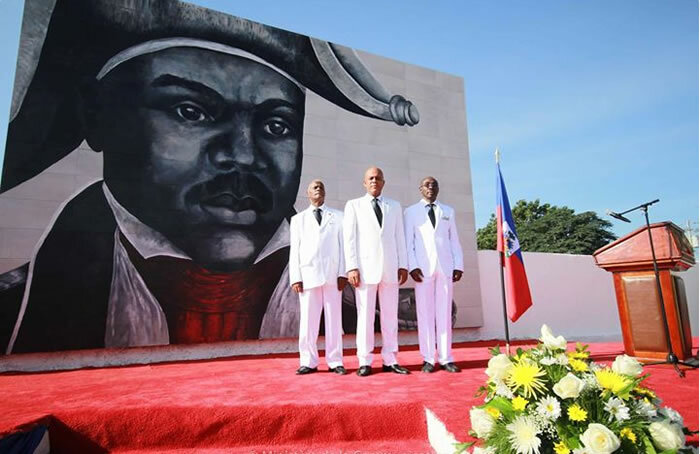 Here is a picture of President Michel Martelly and Prime Minister Evans Paul at 209th anniversary of the death of Jean-Jacques Dessalines. Jean-Jacques Dessalines (20 September 1758 - 17 October 1806) was born in Africa, and was enslaved in the French colony of Saint-Domingue. He was a lieutenant under Toussaint Louverture. After the betrayal and capture of Toussaint Louverture in 1802, Dessalines rose to the power in the army but later he became the leader of the revolution. On 1st of January, 1804, at the dawn of a new age without French colonists or slaves, he renamed 'Saint-Domingue' to 'Haiti' and declared it an independent country, proclaiming himself as the governor-general for life. Later in that year in September, he adopted the title "Jacques 1, Emperor of Haiti". Despite his brutality, he is honored as one of Haiti's founding father.